Welcome to a new ongoing column for TacomaStories.com. It’s called ‘Jack & Mimi’s Cheap Date*’. My girlfriend, Mimi and I like to go out to eat. And so once a week, we’re going to go somewhere in Tacoma, order the two cheapest entrees on the menu. We’ll tell you the price, what we thought of the place, and what we thought of the food and service. 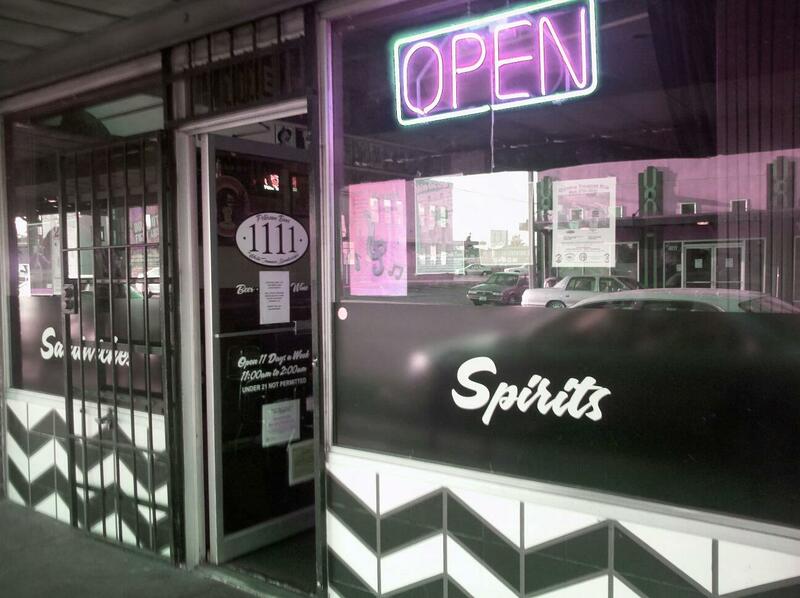 For the first installment, we went to Hilltop’s own, Eleven Eleven. Located at 1111 on South 11th Street, the Eleven Eleven opened almost exactly a year ago by bearded twins Justin and Robby Peterson. This was not my first time at the Eleven Eleven but it’s walking distance from Mimi’s place and I’ve never gone there and been disappointed. It seemed the perfect place to try this little experiment out. We walked in on a Saturday night. It was a busy but not overly crowded. We found a table for two in the back and were almost immediately handed menus. We ordered our drinks and consulted the menu. The Eleven Eleven serves mostly sandwiches and their sandwiches are amazing. Going to the Eleven Eleven and not ordering a sandwich would be like going to the Red Hot and not ordering a hot dog. You could do it, but why? Mimi noticed that the hot sandwiches are almost all cheaper than the cold sandwiches. We looked over the list. Mimi immediately found the grilled cheese sandwich for $7.00. I kind of wanted the Club, but it was $8.75 and there were plenty of options that were $8.50. The more I thought about Mimi’s Grilled Cheese, the better it sounded, but one of the rules of Jack and Mimi’s Cheap Date* is that we order two different things. This way we’re not just talking about one dish. Besides, how boring is it when your date orders the same thing you did? I ultimately decided on the Ham & Cheese. Mimi’s Grilled Cheese came with tomato soup and chips. I also could have added soup but that would have cost more. Mimi chose the jalapeno chips. I chose original flavor. We drank our drinks and from my vantage point I could see part of the kitchen where the sandwiches were being prepared. Each plate that went out looked delicious. I’m likely a bit biased. I’m a big fan of sandwiches in general. My first job was at the Antique Sandwich Company. I knew exactly what Warren Zevon meant when he had been diagnosed with terminal cancer and on Letterman he said, “Enjoy every sandwich.” This is a place that Warren Zevon would have loved. Our sandwiches arrived. Each had a slice of pickle with it. I’m not a fan of pickles so I handed Mimi mine. The chips were small bags of Tim’s Cascade Chips. I opened my bag and ate a couple of chips. For those of you who have not had Tim’s Cascade Chips, they are among the crunchiest chips on the planet. They may very well be made out of potato flavored rocks from the Cascade Mountains. Mimi asked if I could eat them given some recent dental work I had done. I told her it was no problem and hoped I was telling the truth. For two of the cheapest things on the menu, the Eleven Eleven didn’t skimp on substance. My sandwich was full of ham and hot melted cheese. I bit into the sandwich and tried not to smile. I’d never had the ham and cheese sandwich here, but like all the others I’ve tried, it was incredible. As I put the sandwich down, a tiny string of cheese caught in my beard. Mimi laughed. Our check came as we finished. The price of the food was $16.97. So for a twenty dollar bill you can have two great sandwiches along with a 15% tip. Not bad at all. *Jack and Mimi’s Cheap Date does not include the price of drinks. This is mainly because I’m a bit of a craft beer freak and more often than not, I’m not willing to drink the cheapest beer on tap. This entry was posted in Jack & Mimi's Cheap Date, Tacoma Places and tagged Cheap Date, Eleven Eleven, Sandwiches, Tacoma Bars, Tacoma Restaurants. Bookmark the permalink.